"D'azur a une colombre d'arg., bq. et m. de gu., tenant en son bec une branche d'olivier de sin. et acc. de trois estoiles d'or, rangees en chef." "Blue; a silver dove; beaked and legged red, holding in his beak a green olive branch and accompanied by three gold stars, arranged in a line at the top." Family mottos are believed to have originated as battle cries in medieval times. A Motto was not recorded with the Mortier Coat of Arms. Individual surnames originated for the purpose of more specific identification. The four primary sources for second names were: occupation, location, father's name and personal characteristics. 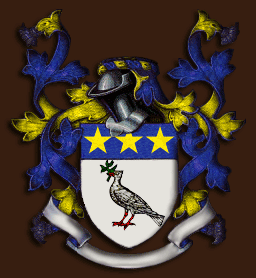 The surname Mortier appears to be occupational in origin, and is believed to be associated with the French and Germans, meaning, "one who was a mason." Different spellings of the same original surname are a common occurrence. Dictionaries of surnames indicate probable spelling variations. The most prominent variations of Mortier are Du Mortier and Mortiers.